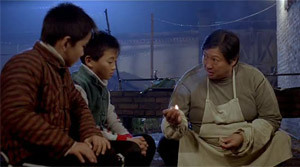 Story: Li Hui (Sammo Hung) enrolls his two sons Li Yi (Wang Wenjie) and Li Er (Wang Yachao) at a wushu academy. There the two children soon become friends with Fong, Zhang and Yauwu. Together they form the "Jing Wu Men"-group. The kids promise to win as many medals for their school as possible and at the same time act as heroes upholding justice. Years later the five kids are still inseparable, but every one of them soon needs to find his/her own path into the future. Yi wants to master a complex maneuver for the next wushu contest which originally his late mother performed. In the meantime, Fong is confronted with her parents not being able to pay her school fees anymore because of financial problems. Therefore, she considers working as a stuntwoman. Kuo Nan (Zhang Jin), a former student, works in the film business and can help her with that. Another former student, He Le (Tie Nan), also asks Kuo Nan for help. He supposedly needs two kids with wushu skills for a movie. In fact, He Le, who years ago was expelled from the academy because of his brutality, wants the kid for a human trafficking ring. The Jing Wu Men try to stop that very ring. Review: Family-friendly martial arts entertainment is rather rare. And where else could it come from than from China, the country in which the good guys always have to win in movies while the villains are brought to justice. In order to give the movie the necessary publicity it is widely released under the title "Jackie Chan Presents: Wushu". After all, Chan has co-produced the movie. Moreover, his buddy Sammo Hung is also to be seen in the flick. Yet, he takes on a rather extensive supporting role and so this lighthearted action flick turns out to be a vehicle for a great number of young talents, who all showcase their wushu skills. 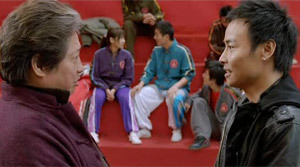 After all, the movie has been shot at a real wushu academy with real students. Accordingly, the physical performances are impressive, but you shouldn't expect any subtly nuanced acting. Sadly, the amateurish acting isn't the only problem. It soon becomes apparent that the directing also reminds us more of a practitioner of wushu just taking the director's chair. And that's not that far from the truth. Director Antony Szeto has also learned wushu next to several other martial arts and he even represented his native country Australia at the International Wushu Competition. The directing may be fast-paced at times, whereas the fast editing is particularly irritating, but he never manages to place emphasis where it would have been necessary. This gives the pictures something amateurish, which often enough you are willing to overlook, but which nonetheless runs through the whole movie. At times, this also concerns the fights, but at least Szeto knows that with his actors it's best to just keep the camera rolling. Unfortunately, he doesn't always stick to that and so the fights are interrupted by fast editing every now and then. This takes a little bit away from the wow-factor of the wushu artists' performances. At least there is no (obvious) wirefu and the actors actually do their own stunts. The fight scenes somewhat lack the right rhythm, but making up for it are a couple of inventive moves. Standing out particularly are the wushu performances whereas even here unnecessary cuts destroy the good overall impression. However, what's nice is that "Wushu" has its main focus on the philosophy of martial arts and thus wushu serves as a tool for self-discovery. It would have been better had Szeto dived into this aspect in more detail instead of inserting a ridiculous subplot surrounding human-trafficking which is supposed to stand as a dramatic hook for some action scenes. Especially the villains are depicted in such a caricatural fashion, at times even free of any acting credibility, that you may even think "Wushu" could be a propaganda film which shows wushu as some sort of tool for getthing rid of anything evil in China. Yes, the pro-China theme is almost problematic. The naive aspects of the film may also be credited to the fact that we see the world from the eyes of the young students, but a certain patriotism and also clich�s concerning the targeted message can't be denied. Consequently, the story is just ludicrous and dramaturgically there isn't a lot happening either. The characters aren't growing either and interestingly enough not even in respect of their wushu expertise. So those who want to watch a movie revolving around getting better in a certain martial art should look somewhere else, too. Since the flick is consistently family-friendly, the fights aren't violent at all. Even when the kicks seem very hard it is relativized by the recipient standing right up as if having received a mere slap. Sammo Hung ("The Bodyguard", "Rise of the Legend") works quite fine as a father figure next to the amateur actors and creates the fundament for them. Only towards the finale he gets a fight, too, which is pretty decent. But that's also the big problem. The fights are just decent and you will miss a real wow-factor aside from the wushu contest performances. And latter ones you can also watch in the shape of several contests online. 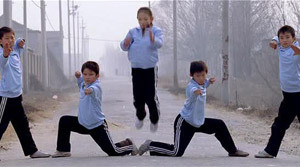 As a family movie "Wushu" may in fact work out, but apart from that the flick remains too shallow, if not to say boring.